The Clos Jebsal is certainly our most contrasted vineyard. 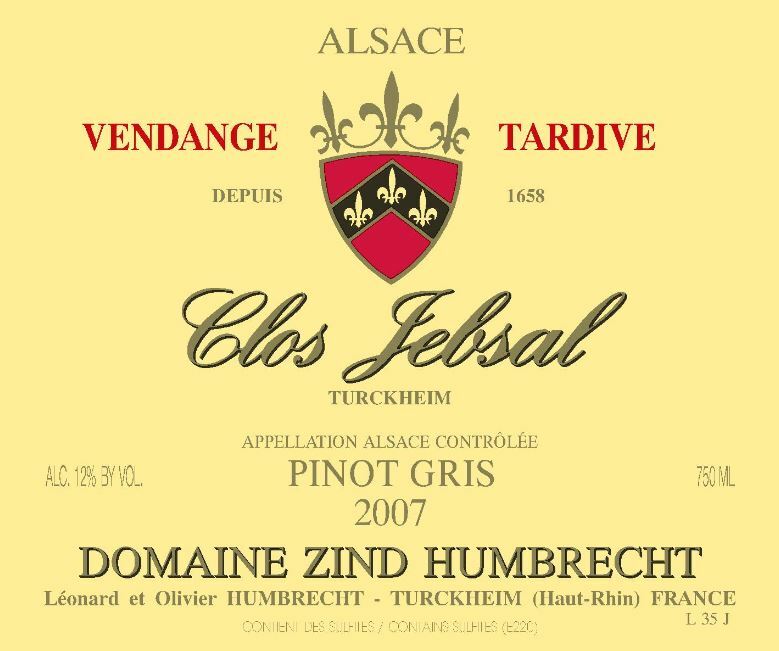 It is located in the warmest and most precocious area in Alsace, enjoying a full south and steep exposure, but the roots grow on a cold rich, deep, heavy marl soil mixed with gypsum deposits and rocks. The soil compensates the effect of the climate and permits us to leave these Pinot Gris grapes a long time on the vines. This contrast also favours the development of noble rot. We have now admitted for a long time that the Clos Jebsal is always expressing itself as capable of producing rich late harvest wines (VTs and SGNs) every vintage. In 2007, the climate conditions were ideal for noble rot development, and because the weather was dry for a long period, we were able to do three different harvest selections: one Vendange Tardive and two different SGN, including one Trie Spéciale. Botrytis is never easy, and we often fear fermentation problems, but in 2007, the noble rot was perfect and fermentations were very slow, stopping at a low alcohol level, producing an elegant style of wine in harmony with the acidity. 2/2009: the nose is extremely elegant, showing soft aromas of vanilla, acacia honey, and some smoky flavours. Still quite closed and subtle, the fermentation flavours (brioche, nutty aromas) are still contrasting with the minerality of this vineyard. The palate is quite surprising. The lower than usual alcohol make it resembles more to a light SGN than a powerful VT. Very soft and elegant finish. This is clearly more a dessert wine.